One day, 40,000 cars and over a million people spread out on a ten mile stretch of Woodward Avenue in Metro Detroit. Yeah, the sheer size of the Woodward Dream Cruise is hard to express unless you've actually been there. Luckily, one good way's through photos, so here's our first of a series of round-up galleries we'll be running this afternoon showing off the best of the metal from Saturday on Woodward. 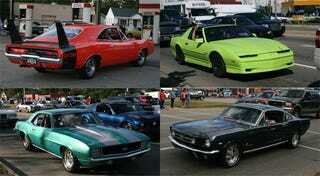 First up are the muscle cars. — Ed. Otherwise-sedate midsize American sedans and coupes with massive engines stuffed under the hood: That's the recipe for a muscle car, and it's the bread n' butter of the Woodward Dream Cruise. Muscle machines are out in force every year, with the Detroit three well-represented, along with independents and oddball makes (and we're lumping the "pony cars" in here too). What doesn't change is the police presence keeping these monsters from frying the treads at every stoplight. Oh well — they're still fun to look at even without turning their tires to smoke, so be sure to click through our full gallery to see the classic and modern muscular machines found at the 2008 Woodward Dream Cruise.